From April 1986 until just after Nelson Mandela's release from prison in February 1990, supporters of the City of London Anti-Apartheid Group maintained a continuous protest, day and night, outside the South African Embassy in central London. 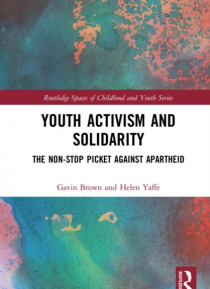 This book examines how and why a group of children, teenagers and young adults made themselves 'non-stop against apartheid', creating one of the most visible… expressions of anti-apartheid solidarity in Britain.Drawing on interviews with over ninety former participants in the Non-Stop Picket of the South African Embassy and extensive archival research using previously unstudied documents, this book offers new insights to the study of social movements and young people's lives. It theorises solidarity and the processes of adolescent development as social practices to provide a theoretically-informed, argument-led analysis of how young activists build and practice solidarity.Youth Activism and Solidarity: The Non-Stop Picket Against Apartheid will be of interest to geographers, historians and a wide range of other social scientists concerned with the historical geography of the international anti-apartheid movement, social movement studies, contemporary British history, and young people's activism and geopolitical agency.